PTSD is an extremely debilitating condition that can occur after exposure to a terrifying event. But whether you're a veteran of war, a victim of domestic violence or sexual violence, or have been involved in a natural disaster, crime, car accident, or accident in the workplace, your symptoms may be getting in the way of you living your life. 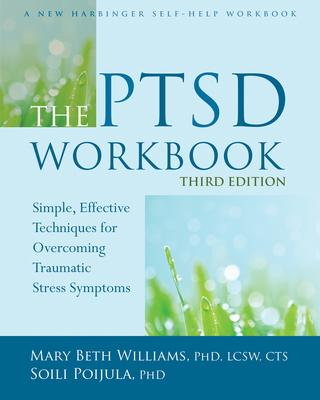 In The PTSD Workbook, Third Edition, psychologists and trauma experts Mary Beth Williams and Soili Poijula outline techniques and interventions used by PTSD experts from around the world to conquer distressing trauma-related symptoms. In this fully revised and updated workbook, you'll learn how to move past the trauma you've experienced and manage symptoms such as insomnia, anxiety, and flashbacks. Mary Beth Williams, PhD, LCSW, CTS, is an author, researcher, lecturer, and trainer in the area of trauma. In addition, she treats trauma survivors in private practice at the Trauma Recovery Education and Counseling Center in Warrenton, VA. Williams is former president of the Association of Traumatic Stress Specialists. She is a trainer for US Customs and Border Protection, cofounder of the proposed 501(c)(3) US Vet Source, and author of many articles, chapters, and books about trauma disorders.Soili Poijula, PhD, is a clinical psychologist, licensed psychotherapist, and director at Oy Synolon Ltd., a center for trauma psychology in Finland, where she has done pioneering work as a developer of post-trauma psychotherapy.